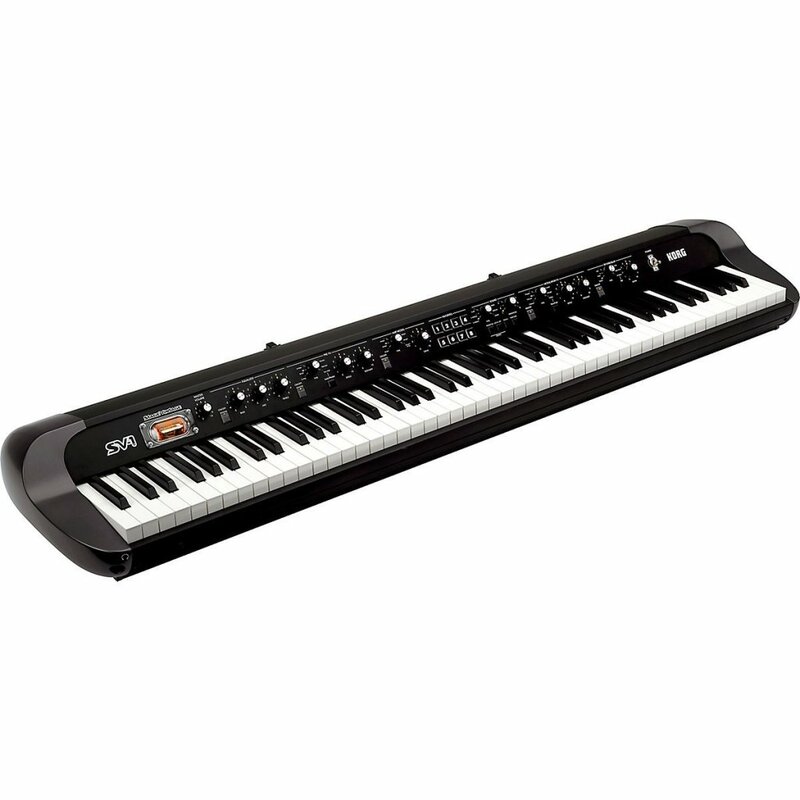 The Korg SV-1 is a stage piano that comes in two versions, the 73-key and the 88-key version, with 2 foot pedals. They are on average lighter than other stage digital pianos and keyboards, weighing up to 55 pounds. It has a maximum polyphony of 80, which is on average 38% lower than on other digital pianos and keyboards. The Korg SV-1 has 36 preloaded songs. This is slightly less than the average number preloaded on other digital pianos and keyboards. It has unbalanced and balanced stereo outputs at the back, MIDI in and out ports and stereo inputs to integrate other sounds into your playing. The Korg SV-1 has a Japanese grand acoustic piano tone, most likely a Yamaha which has first rate sampling. It has an impressive soundboard with superb sympathetic resonance. The Japanese grand piano also has velocity sensitive RX noise layer which recreates the depression and release thunk of the pedal. This creates fantastic sound effects, great for advanced and professional piano players. There is also a German grand acoustic piano tone, most probably a Steinway. It has a more evident multisampling than the Japanese grand, which adds to the choice of the pianos to play on the Korg SV-1. The third acoustic piano tone is the Upright multisample, which is really great and only slightly less impressive than the grand piano. It has more compact sound field, though, with more pleasant tones. It is arguably one of the best emulations of an upright piano. Selecting the preloaded onboard sounds is very easy due to the very user friendly simple front panel. Selection of the preset sounds is done by rotary selectors. Selecting the equalizers, amplifications and other settings is very easily achievable, using single dedicated buttons without diving into menu selections. This gives the player the convenience of concentrating on playing the piano. It has RX (real experience) technology which captures real Rhode sounds like electrical and mechanical noise, contributing to its authenticity. The Rhode samples are very dynamic, with smooth transitions from soft to hard samples. This contributes to a great experience with fantastic sounding music. The SV-1 has definitely some of the greatest acoustic piano samples that you can find out there. It has very rich effects choices, with a three band equalizer for drastic or subtle tone shaping. It also has very authentic preset effects like the tremolo, booster, vibrato, univibe, compressor and a beautiful Vox wah emulation that can be controlled using an external pedal. There is also modulation effects with nice phasers and choruses that help to make some real nostalgic effect/instrument combinations. Besides these, there’s also a nice rotary speaker effect that can be applied to the instruments. All these enable you to express your true creativity, without experiencing too many technological burdens around it. The Hammond emulations do not sound authentic and the only way to change them is through the chorus/vibrato editing software. The SV-1 lacks filters and drawbars, it should have made better Hammond and synth samples. It has poor strings, organs and polysynth sounds which are inferior to the competition. The Korg SV-1 was not designed to be the best in every aspect, and it excels with its pianos, whether electrical original, electro-mechanical or acoustic. The Korg SV-1 is evidently one of the best electric and acoustic piano emulators in the market.